Sloped arms, a button-tufted back and sleek metal legs give our Luke Power Reclining Sofa a mid-century modern flair, but look closer. 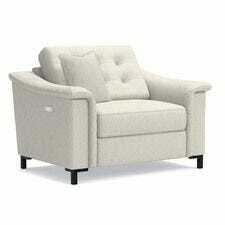 With dual-sided reclining power plus built-in USB ports this timeless design has been given a modern makeover. Introducing duo from La-Z-Boy®. This revolutionary new line of sofas, sectionals, loveseats and chairs pairs the power to recline with style you'd never expect. Discover the new look of reclining comfort with duo.